Hi all, recently came across an interesting Rubberduck project. Did you think that VBA is dead and buried? It looks like it’s not going down that easily! Rubberduck is a COM Add-In for the VBA IDE that makes VBA development even more enjoyable, by extending the Visual Basic Editor (VBE) with menus, toolbars and toolwindows that enable things we didn’t even think were possible when we first started this project. If you’re learning VBA, Rubberduck can help you avoid a few common beginner mistakes, and can probably show you a trick or two – even if you’re only ever writing macros. If you’re a more advanced programmer, you will appreciate the richness of Rubberduck’s feature set. 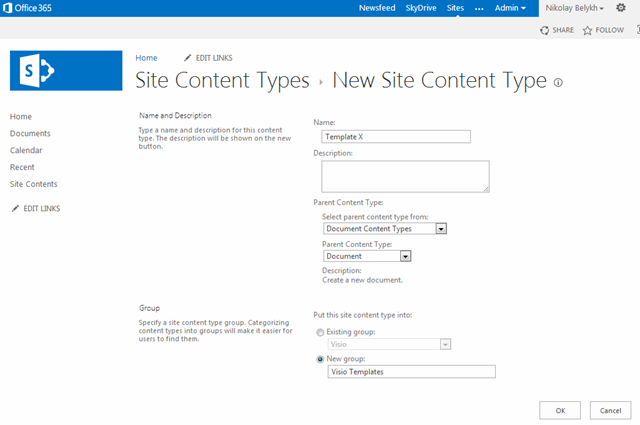 1) You have a SharePoint (or Office 365 with SharePoint site, doesn’t really matter). Note that you don’t necessarily need Visio Process Repository (and thus SharePoint Enterprise). You can use normal document library as well (it will also work, just not all functionality will be available). 2) You want to provide some Visio template to your users (or for yourself) so it is possible for them to create new diagrams using that template directly from the site. For example, if you work in some organization, and want your users to use a specific template to draw diagrams. In this post, I have added a Visio “Template X” as an example (containing “Stencil X”). 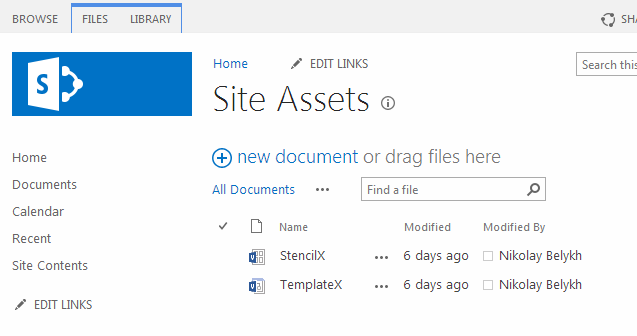 Note that template and stencil should be stored in the same folder in SharePoint so that Visio can find the stencil when it creates new diagram out of the template. 1. Create a template and a stencil. 4. Allow this content type for the document library where you want to store you Visio drawings. 1. Creating a Visio template and stencils. I think this part is pretty much covered in Visio documentation. Note that you can just use existing Visio template/stencil, in this article I create new ones for demo purposes basically, to show how to make it all from scratch. 2. Uploading to SharePoint site. Uploading should not be a problem, you just select a target library and save stencil and template to that library. I opted to use “SiteAssets” as it exists by default and contains files related to the site. Note that in SharePoint library settings you have an option to “edit template” – this was designed to work with Word/Excel and may not work as expected for Visio, if you have a custom stencil. So if you have both custom template and stencil, I would recommend to put them next to each other in one library. 4.2 Ensure that “Content type management” is enabled under “Advanced” (option should be checked). 4.4 Select “Template X” created at the previous step, click “Add”, “OK”. You should get this content type listed now under “Content types”. 4.5 Click the “Template X” now (we will assign template for it now). 4.6 Click “Advanced settings”, and the in the field “Document template” enter the path to the template in the “SiteAssets” document library, like “/SiteAssets/TemplateX.vst”, Click OK.
4.7 Now new option should appear under “New” menu, listing our new template. That’s it. Now the template should be under “New” menu, and everybody who has access to the library should be able to create new diagram using that template (and stencil). I personally participated in the review process of this book (as a technical reviewer), and I would like to recommend the book for all Visio users and developers, who model processes with Visio, or develop their own solutions using Microsoft Visio. The book includes a lot of useful information on Visio diagram validation (check out the Rules Tool), Visio solution publishing (in particular, e.g. SharePoint 365 integration), Visio add-in development using .NET and WPF technologies, and many other interesting topics! If you are a Microsoft Visio 2013 Professional Edition user or developer who wants to get to grips with both the basic features of Visio 2013 and the new Validation Rules in this edition, then this book is for you. A working knowledge of Microsoft Visio, and optionally .NET for the add-in code, is required, though previous knowledge of business process diagramming is not necessary. More experienced Visio users will gain valuable knowledge for building add-ins and creating and publishing rules. If you want to achieve results from Visio 2013 beyond the ordinary out-of-the-box features, then this book is ideal for you. Although this book covers the Professional Edition, much of the book is still useful if you are a Visio 2013 Standard Edition user.